When it comes to compact crossovers it's hard to think of many that have been around longer, or been more successful than the Toyota RAV4. This year's 2017 Toyota RAV4 is the fifth model year of what's still only the fourth-generation of the compact SUV, so let's take a look and see how it's doing and look a little closer at why it's been so successful for so long. A good deal of credit has to be given to Toyota for refusing to play it safe with the styling of its most recent vehicles. The all-new CH-R is as modern and futuristic as anything in the market, and the current Toyota RAV4 isn't too far behind. There was a bit of a refresh last year for the RAV4, but apart from the odd tweak here and there, the majority of effort was put into upgrading the interior rather than doing anything too radical with the exterior. It's probably fair to say the modernist styling of the Toyota won’t be universally loved, but it really is great to see a mass-market model taking a few risks to give us something a little different, especially when it must be tempting to remain pretty conservative with a model that sells in such big numbers. The base engine in the 2017 RAV4 is a 2.5-liter inline-four that develops a useful 176 horsepower and 172 lb.-ft. of torque. Somewhat unusually, and possibly as another sign of the futuristic forward thinking of Toyota, the more powerful powertrain option for the RAV4 is actually a hybrid rather than another combustion engine. A hybrid in a compact crossover is pretty rare in itself, but the fact it's the most powerful version of the Toyota might be a glimpse of what's to come with other models, and possibly even other manufacturers, going forward. The hybrid isn’t a track monster by any means, but with 194 net system horsepower and some pretty good fuel economy ratings, it really is well worth considering. Fuel economy ratings for the RAV4 are probably not as straightforward as you might imagine, and that's because the ratings vary by trim level due to the two different wheel sizes. Front-drive versions of the LE and XLE models are the most frugal non-hybrid models with EPA ratings of 23 mpg in the city, 30 mpg on the highway and 26 mpg combined. 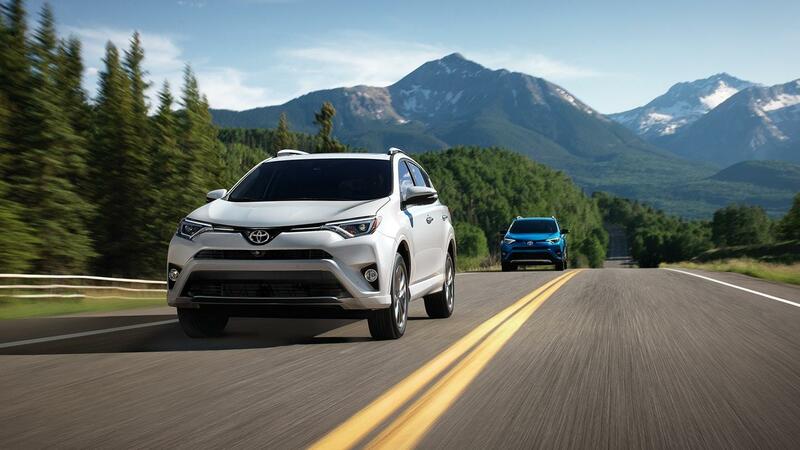 * Of course, the RAV4 Hybrid is the fuel economy champion of the family, as even with its standard with all-wheel drive it's rated as good as 34 mpg in the city, 30 mpg on the highway and 32 mpg combined. Safety might not be the coolest feature we think of when considering buying a new vehicle, but it's certainly worth mentioning here as Toyota has recently started going above and beyond with standard and available safety features and equipment in all its vehicles. This year, Toyota has added a whole load of important standard safety features to the RAV4 that now put it right at the top of its class in this area. As you'd probably expect then, the NHTSA gives the Toyota a full five-star rating for overall safety while the IIHS names the Toyota a Top Safety Pick+. And you really just don’t get better than that. Don’t just take our word for how good the 2017 Toyota RAV4 is though; get in touch with us here at Pedersen Toyota today for more information and to schedule a test drive to try it out for yourself.